Vehicle technology has augmented rapidly in past few years, especially in the field of braking systems to provide advanced braking systems and sensing systems. In parallel to the development of advanced braking system m sensors have developed that can detect physical obstacles around the vehicles. With growing number of road accident fatalities automotive OEMs and regional governments are taking initiatives by mandating safety features such as automatic braking systems in vehicles, which is the major factor for the development and growth of heavy vehicle automatic braking system market. For instance, in 2016, automotive manufactures representing more than 99% of overall United States vehicle sales, pledged to equip all new cars in the United States with automatic emergency braking (AEB) systems as a standard feature by 2022 and on all new trucks by 2025. Moreover, high acceptance rates in developed countries by consumers are likely to boost the adoption of automatic braking system which will propel the growth of heavy vehicle automatic braking system market over the forecast period. 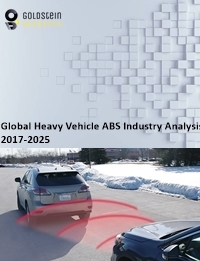 Goldstein Research analyst forecast the global heavy vehicle automatic braking system market to expand at a CAGR of +16% during the forecast period 2017-2025. Moreover, automatic braking system market for heavy vehicles is projected to grow and reach USD 5.3 Billion by 2025, government mandates in European countries and the US shall be the key factors for the growth of this market. Based on technology, low speed heavy vehicles automatic braking system is expected to dominate the market across the globe in coming years. Research and development activities by the major automotive manufacturers such as Volvo and Daimler AG to deploy the semi-heavy vehicles automatic braking system by next few years, will significantly boost the growth of heavy vehicles automatic breaking system market. Geographically, Europe region is anticipated to be the largest market for heavy vehicles automatic braking system as the consumers and governments in the EU are focused towards adopting advanced safety technologies thus driving the heavy vehicle automated braking system demand. North America is likely to be the fastest growing regions owing to future U.S. regulations for active safety technology for big trucks. With over 10 million commercial trucks on U.S. roads, there is extensive opportunities that will boost the market growth after favorable mandates in coming years. According to our global heavy vehicles automatic braking system market study on the basis of extensive primary and secondary research, one major trend in the market is the development of autonomous features to advance driver and passenger safety. In coming years it is anticipated that majority of new vehicles will have some form of automation to improve driver safety. These features will include highly sophisticated collision prevention systems that automatically brake or slow down the automobile and keep safe distances from vehicles ahead and behind under cruise control. According to the report, major driver in global heavy vehicles automatic braking system market is rapidly growing investments and R&D activities by automotive companies and favorable government policies for faster development and deployment of automatic emergency braking system in heavy vehicles that can minimize truck fatalities by roughly 44 percent to 47 percent. For instance, European Union is considering mandating automatic braking system in cars by 2022 and in heavy trucks by 2025, which will boost the growth of heavy vehicle automatic breaking system market. Further, the report states that one challenge in global heavy vehicles automatic braking system market is rate of adoption in mass market. Majorly the developed nations are taking initiative to mandate these systems; on the other hand low adoption rate due to its high cost of technology in developing regions is restraining the market growth in high potential developing countries. The report covers the present ground scenario and the future growth prospects of the heavy vehicles automatic braking system market for 2017-2025. The first objective is to offer background on the current state of automatic braking system technologies. The second and more central goal of the report is to outline the impacts of heavy vehicles automatic braking system deployment in coming years. The report also explores market players’ activity and the role of each top industry issue across several levels of truck automatic braking system technology, offering a discussion of impacts to drivers and operations in general. Global Heavy Vehicles Automatic Braking system Market Report has been prepared based on an in-depth market analysis from industry experts. The report covers the competitive landscape and current position of major players in the global heavy vehicles automatic braking system market. The report also includes porter’s five force model, SWOT analysis, company profiling, business strategies of market players and their business models. Global heavy vehicles automatic braking system market report also recognizes value chain analysis to understand the cost differentiation to provide competitive advantage to the existing and new entry players. Our global heavy vehicles automatic braking system market report comprises of the following companies as the key players in the global heavy vehicles automatic braking system market: AB Volvo, Robert Bosch GmbH, Daimler AG, Mitsubishi Motors, Toyota Motors, Volkswagen and Tesla Motors Inc.